I was trying to think of a treat to take to work the other day and cupcakes came to mind. I hardly ever make them, because I literally forget about them. It’s interesting to me how people respond to a cupcake versus a regular cake and the fact that just having it in a single serve size brings such happiness to people. I hate to admit it but I used a chocolate cake mix for these and then made my favorite chocolate frosting (hence the lack of a recipe for this posting). Piping icing on cupcakes always seems easier to me than individually frosting them with a knife, and I think it looks a little better too. So here’s to a yummy cupcake, which was forgotten and brought back to existence! If you are feeling guilty using a boxed cake mix and need a recipe for chocolate cake, you can find it here. Combine cocoa with melted butter in mixing bowl and mix until combined. Alternately add powdered sugar and milk 1/3 at a time while mixer is at a medium speed. Add more milk if necessary until desired consistency is reached. Stir in vanilla. Nice piping, Jason! 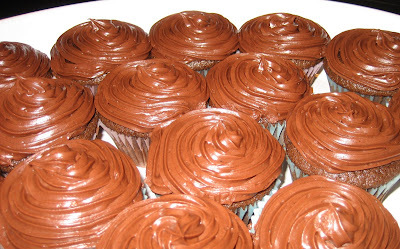 I can't think of any time when a lovely chocolate cupcake would not be welcome.